You have chosen to ship your car to Alaska instead of trying to drive it there. We do not blame you. The drive to Alaska can take a week or longer depending on where you are driving from and how long you are taking breaks for. Shipping your car to Alaska might take a few extra days than driving would but you won’t have to deal with the stress of driving through multiple states and Canada to get your car there. Kayak – Kayak is a long trusted site that has been in business for a decade and a half. They have over two billion searches per year on their site from people looking for travel information and deals of flights, hotels and more. Trip Advisor – Trip Advisor is another great site to check out and compare information about cheap flights to Alaska on. Trip Advisor has been around for almost two decades now since its founding in the year 2000. Based on last year’s data, it is the world’s largest travel site. Expedia – Expedia was founded back in 1996. It’s a full-service travel site that can help you with almost any of your travel needs from flights to attractions. The site boasts over thirty million travel related reviews. Travelocity - Travelocity is another trusted and even more well marketed site for finding flights and other travel arrangements. You likely recognize their name from their entertaining television commercials. They are owned by Expedia. CheapFlights – Cheapflights is a subsidiary of Kayak. It was founded over twenty years ago. It is another great choice if you are looking to get a discounted flight to Alaska. Skyscanner – Skyscanner is another travel fare aggregator website and was founded back in 2002. It is another well-known and trusted alternative to finding cheap flights. It is owned by Ctrip which is the biggest travel company in China. You might not care that much about the cost of your flight to Alaska. You may just want a nice and stress-free experience during your flight. Most airlines will have regular flights which all have the typical boarding and flight processes. However, some airlines have higher rates of things like mishandled baggage or rate of overall complaints. 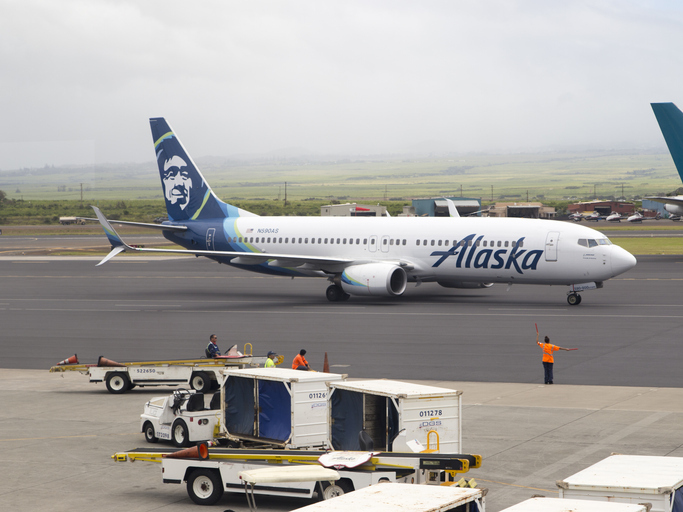 Alaska Airlines – Alaska Airlines is the top airline for flying to and from Alaska. They started their operations almost seventy-five years ago and has most of it’s operations and hubs on the west coast of the United States. You can get a flight on Alaska from almost anywhere in the US though. Flights from New York’s JFK airport to Anchorage, Alaska cost between seven hundred and a thousand dollars as of February 2019. Delta – Delta started its operations almost a century ago back in 1929. It has long been one of the biggest and most trusted names in air travel. They offer many flights to Alaska which can vary greatly in price depending on when you are traveling, where exactly in Alaska you are traveling to or from and what class of ticket you choose. Deal with your flight online – Most airlines now have apps that you can download to your phone. On these apps, you can check-in for your flight, check out your flight status and much more. This can help you save a lot of time during the boarding process. Dress for your destination – If you are traveling to Alaska during the winter months it will be quite cold when you step out of the airport. Make sure that you dress warm enough for that weather. At the very least, put another coat and/or pair of gloves in your carry-on luggage so you can put it on when you arrive. Measure your carry-on bag – Make sure that you measure your carry-on bag so that you don’t have to end up checking it. Each airline will have their own specifications regarding this so be sure to check the airline’s website or to give them a call before you pack for your flight. Double-check what you can and can’t carry-on – Be sure that you properly limit any liquids, creams, gels and aerosols. They must be less than three and a half ounces per item. Keep them in a bag that is easy to access when you are at the checkpoint. Be sure to factor in leg room – Flights to Alaska can be pretty long. Many make use of connecting flights. Be sure that if you have any comfort related issues that could require extra leg room that you purchase a seat with enough space. Your flight to Alaska can unfortunately get complicated in several areas. We hope this guide will help you as much as possible. Either way, your car shipment to Alaska should not be. That’s why you should ship with Alaska Car Transport. Worry about your flight, not your vehicle shipment.